Nomination Suggestions for Cybils 2012! I've discovered it's really hard to remember that great title I read 11 months ago - so I collect what I consider Cybils-discussion-worthy titles every week from what I've read and reviewed and save them up. So, here are my suggestions if you need something to jog your memory! (no promises that these are eligible - you'll have to double-check that yourselves - or that they're in the right category. This is just a list of suggestions). This week at the library; or, The weather is perfect so why am I sick? Siiiiick all last weekend. Not a good start to the week. No zoo trip for me *sob*. My We Explore program is proving very, very stressful. Hopefully I will be able to relax about it soon...new resolution. All complaints, suggestions, etc. will be met with "Thank you for letting me know. I'll certainly look into that." No more trying to explain, justify, or convince people. Next up, I'll work on some deep zen breaths and ignoring the silent dislike I feel emanating from certain parents. An even more Mondayish night than usual. Fish tank sprang a leak (fortunately the teen who takes care of it lives up the street and he hopped on his bike and came over to fix it), some very unhappy patrons (computer-related of course), the website crashed while I was trying to update it, and it was unusually busy. Still feeling sick on and off most of the week. Some days I wake up and think how nice it is to do lots of different things and I am excited about all the programs and other projects. Some days I wake up and think how nice it would be, just once, to go to work and not have a mile-long to-do list, to not have programs every day and not feel guilty about it, to have someone else worry about publicity and to not have to deal with the public computers. To not have panic attacks before every program, wondering if people are going to come, if enough people will come, if my numbers will be good, if people will like it, if they will complain, if they will come back. Some days I wonder if I'm the only librarian not on happy pills and where can I get me some? Some days I just want to be a cataloger again. Had to turn away people for the first time from the 10am session of Pattie's Toddlers 'n' Books. Some people were disappointed but understanding. Some people were NOT. Everyone complains that the storytimes are too big, too crowded, too noisy, too chaotic, but they never want to be the ones to come at a different time or miss storytime a week here and there. I don't think I can take the stress of lottery registration. Feel even sicker. Might do pre-registration next session. Collected all the kids in the library and walked a couple blocks down the street to get giant boxes (nobody's car was big enough). They were hot but helpful! Lest you think it is all about me, I will add that I am not the only sick person. So far, out of our 15 staff 7 are or have recently been ill, ranging from a life-threatening illness and completely debilitating back pain to random sicknesses and one is leaving - she found a job that will enable her to only work full time during the week and her part-time jobs only on the weekend, instead of all of them simultaneously. Apparently she decided to stop getting rich off doing nothing in public service (quote from member of the city council, another source of stress). I voted that we take a group trip to the doctor on staff work day, instead of doing inventory. I have a new volunteer. An adult volunteer. I mean, my 12 year old girls over the summer were awesome (very!) but this is a whole new ballgame. I just wave at stuff and voila, it's DONE! This story felt so...outdated to me, that I looked up the publication date to see if it was a reprint. Nope, new series starting in 2009. Well. 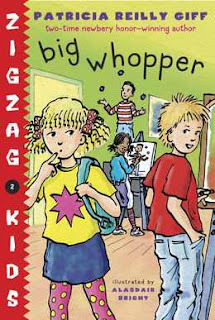 This is the second title in the Zigzag Kids, a group of multicultural kids who attend an after school center. In this story, Destiny Washington is worried that she can't think of anything to put on the big sheet of paper in the hallway for discoveries. She's being annoyed by stuck-up Gina and says the first thing that comes into her head. Unfortunately, it's a lie. After several days of misery, Destiny finally admits her lie when it sounds like Gina is about to tell on her. The two decide they really do have something in common after all and become friends somewhat. Why this felt outdated to me: First, I don't know any schools that run an after school center, especially with the amount of activities discussed here. That could just be my school district, however. However, the kids' reactions and behavior felt stereotyped and predictable. Destiny's heart-burning over her little fib, her determination to be the kind of good kid that Zigzag center expects...meh, it just didn't work for me. 5. Bears Beware - Mitchell again. Although his "best friend" is Habib. Go Habib. Now, I didn't read all these titles, but going on the descriptions it sounds like there's really only four main characters, all white kids. The "multicultural" kids shown in the cast pictures are just there for show. Either make your cast all white, or stop relegating kids of color to supporting roles. I'm not going to pass this anymore, especially in a lack-luster series like this one. I also found two typos, which are a huge bad in a beginning chapter series. Verdict: The cover proclaims that this is by a two-time Newbery honor winning author, but she wins no awards in my library for this series. Not recommended. I'm a big fan of Susan Gal's previous titles, Please take me for a walk and Night Lights. I also loved her recent book, Into the Outdoors, although I didn't review it. It pains me to say that I just didn't love this title. It still has Gal's signature scratchy-textured art, the simple but rhythmic text, and the glowing colors. But it just didn't speak to me the way her other titles did. I think some of this may be the combination of pigs, pink and text. I felt that the text didn't reach the joyfulness of Please take me for a walk, for example. When the dog says "I want to feel the wind lift my ears and the sun warm my belly " you can just feel the yearning and exciting possibilities of outside. 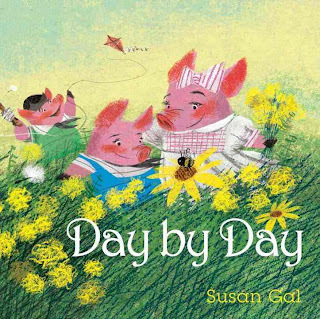 But when the pigs' text reads "Arm in arm, new friendships begin./Then row by row, pigs plant a garden." I just feel bored. Gal's artistic style hasn't deteriorated and I loved the endpapers. They have the gorgeous swathes of color, tiny bright splashes, collage hints, and textures so rich you just want to rub the page that made me fall in love with Gal's art. I think I didn't go for this one because the scope is too large. Her other titles focus on a single character or small family unit, while this one just keeps adding more and more pigs. To my eyes, it ends up a confused mess of pink splotches. Verdict: All that being said, I still purchased this title for the library. It certainly deserves the "heartwarming" adjective and would make a nice bedtime story for little ones. Not everyone has my objection to pink and many people like pigs with enhanced cuteness. While this isn't going to be a favorite book of mine, it's still a nice title for casual browsers and has circulated reasonably well in my library. I mostly liked this nonfiction title, and I think it would make a pretty good read-aloud, but a few things gave me pause. 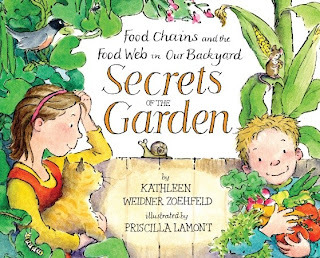 The book is rather cluttered with speech balloons, illustrations of food chains, talking chickens, people, and more. However, this isn't a big deal. The two things that did really bother me are a bit amorphous, but really bugged me. First, when the rabbits show up to eat some of the lettuce, the cat chases them away. "Honey will be good at keeping the rabbit away from our lettuce." Now, I've never heard of using cats as guard animals in the garden; but I have heard about the millions of birds domestic cats kill every year. This isn't really my subject, so I don't know how true it is but I would think that if you're trying to grow an organic garden or encourage wildlife, or if you want birds and not pesticides to eat your pests, having your cat killing that same wildlife is a Bad Idea. The other thing that bothered me was kind of a theme throughout the book. It's supposed to be about food chains and the food web, right? Well, it is, starting with simple food chains like "lettuce grows, rabbit eats lettuce" and going to more advanced food webs. However, there's an odd sentimentality about any food chains involving carnivores. The hawk catches a grasshopper, not the mouse shown in the food chain and the text says "Yikes! Better stay in your nest, mice!". It's never suggested that anybody might eat the chickens - only their eggs are included in the food chain. Also, the word "omnivores" is never defined, although you can kind of figure it out from the text. I think the decision to have anthropomorphized animals, mainly talking chickens, was a bad choice when writing a book about food chains and food webs. Verdict: The basic idea of the book is good, but it's too cluttered and disorganized for my taste. 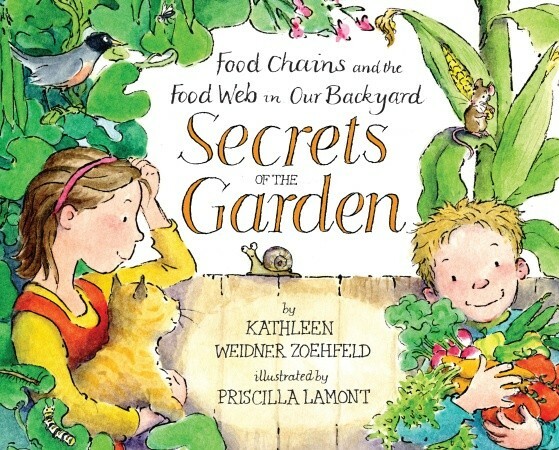 It's more a gardening than a food chain book. Again, we have the extreme reluctance of children's picture books to admit that yes, animals do eat each other. I appear to be the only dissenting voice in the love for this title, so you can probably chalk it up to my weirdness and go ahead and buy it. But it still bugs me. First and foremost...CYBILS!!!! Yay! Happy penguin dances for EVERYBODY!! Even if you were not selected (this year! there's always next year!) Cybils depends on the massive power of the kidlitosphere to keep going and to do our thing. Start thinking about nominations - I know I've got my suggestion list waiting for September 30! I'm organizing for Non-Fiction Picture Books this year, but I'm panelling (is that a word?) for Graphic Novels Round 1. So, those of you who remember that the Cybils icon links to my reviews, don't be shocked if it goes to graphic novels and not non-fiction. I will probably do a round-up post at some point of all the Cybils nominations I've reviewed...or something like that. Still thinking about it. Preschool Interactive, Wednesday at 10. Having done the obligatory fall storytime, I am now free to return to my true interests and we did alligators! Yay alligators! I tried out the new set up of our storytime room (which I used in We Explore) and it worked great, got all the kids that have been sitting at the back of the room, leaving an expanse of storytime rug between us, to scoot up. Realized I have a whole new batch of parents to educate about "process art". Messy Art Club, Thursday 3:30-5 I've been wanting to do a program based on Erica Perl's Dotty for a long time and this is what I finally came up with. I described it as "back to school with Dotty" or "make your own 3-D imaginary friend sculpture". I still think paper mache would be cool, but have not figured out a way to do this that isn't horribly time-consuming. Simultaneous sessions aren't workable, b/c the same people never show up twice in a row. Alas for my good resolutions, the first teacher that called asking for a school visit I scheduled at a time NOT in my outreach times. Oh well. But tour/storytime/crafts are different, since they don't really require any prep, just a little additional throat-usage and some die-cutting. The specific outreach times were just for off-site visits. Really. After much thought and anguish, I have decide to bow to the inevitable and go with Baker and Taylor. However, I insisted on maintaining the right to complain about their interface. Frequently. And I'm sending all my orders for the rest of the year through BWI now, so I don't have to actually touch Baker and Taylor until January. Have accepted with a feeling of despair that at no point will the publicity ever be over. Realized I need additional flyers for We Explore. Guuuhhhhh. Latest nonfiction lunch reading was awesome. As I posted on facebook I foresee the movement of a great many tables in my near future. I've moved tables every day and twice on Thursday! I need lighter tables. Oh, yeah, we had a youth services meeting. Various things were discussed. I was happy to host, as it meant I didn't have to go from daycare to elementary school to systems office, just daycare, elementary, back to work. It was almost 3 hours long, but we had a lot to catch up on after the summer. Yay! My fave preschool/4k called me up to ask if I can start up our remote collection with them again. I always freak out if people don't get back to me - did I send them a book they didn't like? Do they HATE ME and just aren't telling me? Yay, once again I had lunch EVERY DAY. That is my new resolution. Sarah Pennypacker's first middle grade novel is a resounding success. I picked this one up because of the Julia Denos cover and I now have a new rule: Books about beaches with covers by Julia Denos are always awesome. Stella has been sent to stay with her great-aunt Louise. She's sure it's just temporary; soon her mom will get her life back together, take the court-ordered classes, get a job, and they'll have a home again, like they had before her grandmother died. She's not too pleased when Louise takes in a foster child, Angel, whose parents are dead. Having someone else around could derail her plan of getting her mom a job as Louise's assistant, managing the summer cottages. Then Louise dies. Neither Stella nor Angel want to be dumped back into the foster care system. Angel has been through six homes already but she knows her aunt has come from Portugal for her and as soon as she's got enough money, she'll have a home. Stella is sure that if her mom just has a little more time, she'll come back and Stella will never have to move again, she'll have a happy, safe home. One little lie leads to another and another and slowly Stella and Angel start forging a friendship and creating a home for themselves. It's not easy and it's not always safe or happy, but in the end they both find what they need. Verdict: Beautifully written, but never over the heads of its audience. Hand this one to kids who like strong realistic stories with a little bit of sadness and a lot of hope. Although mostly forgotten today, Harry Kellar was once a world-famous magician, known and respected by his contemporaries and the magicians he trained and influenced, including Harry Houdini. The book opens with a brief note about the many stage posters used as illustrations and an account of Kellar's performance for President Roosevelt. The narrative begins with Kellar's adventurous life as a boy, running away from home at age 11, he traveled from Pennsylvania to New York. After a few years, he became fascinated with magic and apprenticed himself to a stage magician. Eventually, he formed his own act and traveled across the world, to Australia, South America, India, and other exotic places. After many years of hard work, he achieved his goal of being the greatest American magician and inspired a new generation of famous magicians. 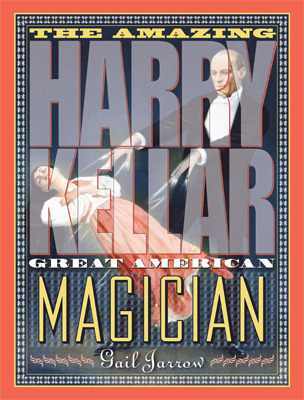 As Jarrow tells the story of Kellar's life, she also talks about the history of magic, including the superstition of magicians' power coming from the devil. The book is laid out to feature the many stage posters, with full page posters, black and white photos, and short chunks of text with bold headlines. The book is oversized, a little taller than the average picture book. Quotes, captions, and historical information are included in sidebars. Back matter includes a timeline, source notes, bibliography, more information on magic and magicians, and an index. Verdict: It's an interesting idea, and the writing is brisk and informative, but the layout felt very cluttered to me. Also, the length of the text would require a middle grade reader, but this age is usually very reluctant to pick up a book that looks like a picture book. Plus, it's just under 100 pages and most biography assignments, at least in my school district, require 100 pages. If you have an audience with a strong interest in magic and history, this might work for your library. Keep your eye on the Cybils blog...there will be exciting announcements on Monday! Homeschool Meet 'n' Greet, Tuesday at 6:30pm. This went great, beyond my expectations! I had my aide help out and we pulled the divider halfway across the community room. One side was art projects for the kids (basic collage - glue, scissors, etc.) one side had chairs, tables with resources, and a table for food. I gave a 10 minute spiel on library resources, then a speaker from the Wisconsin Parent's Association did a question and answer/informational thing. I think it was past 7 when the kids were getting really antsy, so we pulled out the food (cheese, crackers, grapes, chips, salsa, $35) and mixed and mingled. I talked to people, got lots of names and numbers, and one woman agreed to be the central contact (although not a leader per say) and they're going to have an initial meeting at the library. There were about 50 people there and I don't know how it will pan out as there was a lot of variety, from "serious" homeschoolers to people who were just thinking about it, some people were very anti-school and some weren't, and I got the impression that there was a lot of religious diversity too. However, in a small town if you're going to have a homeschool group you have to compromise so hopefully it will be fine. Preschool Interactive Wednesday at 10. Woo! People came! I had a whole new group of kids, parents, grandparents, dads, and friends. I was a bit worried b/c 4k is going to five days a week, but lots of 3 year olds and some 4's from out of town came and we had a very good group, about 40. As usual at the beginning of the year, the age skewed younger and kids were very restless. I did reassure a couple parents (boys of course) that I'd rather their kids played with the trains and listened outside the door than they dragged them kicking and screaming into storytime. Luckily, I have an awesome story about a little boy who played outside the door with trains for a FULL YEAR before one day walking in and plunking himself down...and he knew every rhyme and song and participated in everything. He had been listening the whole year, just as I reassured his mom he was! We Explore Friday at 10 This was our first We Explore and it was AWESOME. I did a new set up for the room, which got everybody up to me on the carpet, instead of sitting way back with an empty carpet between us. The mix of stories and songs was just right. It was a little crowded, with about 50 people, due to some problems with the registration system (I was aiming for 40ish) but I'll take it! Fewer people are registered for succeeding events and I don't know if that's because they think they're registering for everything when they sign up for one program, they wanted to try one and see if they liked it, or maybe they really don't want to explore monsters...although I did say they wouldn't be scary! Lots and lots of phone calls. Ugh. We started registration for Miss Pattie's two Toddlers 'n' Books sessions today and it worked great, much to my relief. 34 people at the first session, 16 at the second, which rounds up to a total of 50, that being the average that normally attends the one program we used to have (when 75 people aren't showing up!) . The kids loved getting their "storytime stickers" and while a couple moms asked why we were changing things, they seemed satisfied with the answers and everybody was happy. Hopefully I will not have to turn anyone away and they will self-select for the different sessions! 1,000 Books Before Kindergarten (herewith abbreviated to 10KBK) started on Monday and so far we've given out approximately 100 folders! Somehow vacation is much less relaxing when you return and can't see your desk (which you left COMPLETELY clear). Programs start back this week, we're testing registration, my beloved vendor BWI has apparently sold some part of themselves to the evil monolith that is Baker and Taylor (I hate them. Their interface is all things horrible). My new programs haven't been fully integrated into the schedule yet, so I'm working more 8.5 and 9 hour days than I had bargained for (this doesn't sound long until you factor in that I am really bad about over-scheduling myself and usually get maybe 15 minutes for lunch if at all). Huge stacks of books on my desk, boxes of supplies, the storyroom to set up for programs, and so on. Frank Viva has won quite a few awards and a lot of acclaim for his Along a Long Road. I didn't care for it and it didn't work well in storytime. But this new title really works for me. In stunning landscapes of color, shape and line mouse and a strange Charlie Brown-like figure travel down to the bottom of the world: The Antarctic. 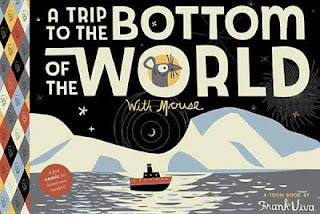 Mouse adds a human element to the awe-inspiring landscape as he make silly comments and complaints, enjoying the journey but always a little doubtful about the trip. The design changes from four small panels to full-page spreads as mouse and his friend look at the vast world they're traveling through and then return to their own concerns. Verdict: This won't have the instant appeal of Fly Guy, but it's well-written, beautifully illustrated, and has a great layout. 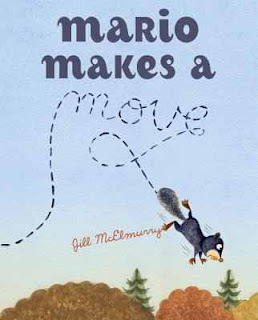 Kids and parents looking for something a little different with some gentle humor (which might as well be the slogan for Toon) will enjoy this odd but stunning little book. I listened to this book on audio, after skimming through the previous title (also on audio) to refresh my memory. 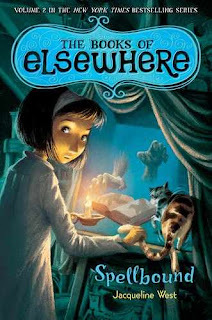 While I loved the first book, with its mixture of mystery, creepy, and fantasy, the second book didn't work as well for me and I had to really push to finish it. Some of this might be that I'm really not an audiobook person, and usually only listen to stories I'm familiar with, so they're kind of background noise. On the plus side, I did finish it and I did want to know what happened next. The creepy, mystery, fantasy is still there, but the character of Olive is, well, kind of dumb. Her parents' eccentric mannerisms are nerve-grating, and the cats are cryptically unhelpful. Too much anticipation, suspense, and slow descent towards an obvious conclusion. However, that's an adult reader's view. Kids won't have a problem with some of the more obvious clues and will eagerly follow Olive's twisting adventures. Olive is still friendless. The weird new boy next door, Rutherford, doesn't count, Morton is drifting farther away into the world of the paintings, and she resents the cats' power and their cryptic and unhelpful warnings. Her parents are just as strange and neglectful of their daughter. In her state of extreme isolation, it's not surprising that Olive easily falls prey to the power of the house and the spellbook. She sinks deeper and deeper into its dark magic, becoming controlled by the house and the book, until she makes a bad choice and loses the friendship of the cats. After this, she struggles with the urge to use the spellbook, and battles her feelings of guilt over Morton and her suspicions of Rutherford. She also picks up more and more pieces of the dark mystery surrounding her house and the previous inhabitants. Verdict: While it all seemed quite obvious to me, I'm, you know, an adult. This has been a very popular series with kids and they don't seem to mind some of the more obvious foreshadowing. 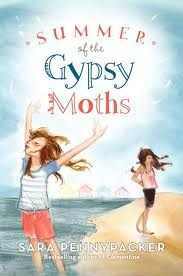 The thrilling tension of the story catches the reader as tightly as the spellbook catches Olive, pulling her along to an exciting conclusion. I'm pleased that this isn't one of those doorstopper tomes and it's well-written and exciting. It's one of the few series where I don't have a crisis over buying the sequels. I'm rummaging through our nonfiction section with a rather vague idea of weeding at some point (this is a complicated procedure, involving not only the simple removal and replacement of outdated materials but also complex statistical and political maneuverings) and thought I'd bring out some old favorites to look at again. Jim Arnosky, the master of nature books for children, has some lovely guides to outdoor experiences. In our geographical area, brooks are fairly common, as are lakes, wetlands, etc. so this one is most useful. The book moves chronologically, starting with an explanation of the formation of brooks, then moving on to equipment and safety. The brook explorers are ready to get started and Arnosky walks you through the brook and its environment. He covers the stones, insects and larvae, wildflowers, collecting small creatures, fish, birds, and animal tracks. A final author's note gives additional suggestions to teachers and parents and further information is included in a bibliography. Arnosky's lush oil paintings are softened into pastel greens and yellows in this user-friendly title. There are drawings of the various creatures, illustrations of equipment, and cheery cartoons of brook explorers discovering the wonders of the outdoors. Verdict: Recommended for any school or library in the vicinity of a brook - and if you don't have one, this book will encourage you to find out about creating your own miniature wetland or brook to investigate! This title has held up well since 2008 and won't become outdated any time soon. Mario the squirrel "likes to invent amazing moves". There's an awesome full page spread of Mario's cool moves. His whole family think's he's amazing. All except Isabelle, who's obviously a math whiz (note the thick glasses and graph paper!). She's easily worked out Mario's moves, plus some cool moves of her own. "That's nice" she tells Mario politely. After a demonstration of her own amazing move, Mario refuses to be friends with her anymore because A. she stole his move and B. she's not allowed to have a move. Only the amazing Mario is apparently allowed to have moves. Isabelle points out, very reasonably, that all the animals have moves. She doesn't point out, but quite easily could have, that her move is nothing like Mario's, being much more difficult and involving advanced math as compared to Mario's, which is just a leap through the trees. Mario goes into a depressed sulk and starts collecting "amazing sticks" that being the only thing he can think of that nobody else can do. Isabelle, apparently realizing that she has stepped out of the natural order of things, then asks Mario to teach her his move (you know, the one she had previously mastered in, like, ten seconds flat? The one that was really simple compared to her own move?) and tells him how wonderful it was. She was wrong, it's not just nice, it's elegant and graceful! Only Mario can teach her how to jump from point A to point B. She'd probably be willing to do all his math for him if he'll just talk to her and be happy, thus justifying her empty existence without his friendship! Mario graciously asks her to teach him her move as well. Then together they create even more amazing moves. I bet when they went to college Isabella did all his research and wrote his papers, all while constantly assuring him that all she needed was to bask in his awesomeness and never get credited for any of her work. Verdict: Of course I don't think the author deliberately set out to write a story with the message that girls have to constantly stroke boys' egos and can never be better than them or they'll get upset and - gasp - stop talking to them! She probably intended to point out that it's not necessary to be better than everyone and by working together you can do even more amazing things. But you know, group work isn't always better. I'm personally against teaching kids to downplay their own abilities and strengths so as not to make other kids feel bad, although I don't advocate boasting or going out of your way to make people feel inferior. But exactly what is Mario bringing to this equation, other than an over-sensitive ego, poor sportsmanship, and the need for someone to constantly assure him that he's amazing, even when he's not? 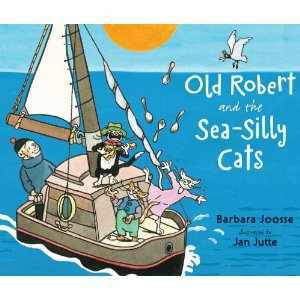 Although they're not always the most popular of titles, or the best in storytimes, I love Barbara Joosse's collaborations with Jan Jutte. In this story, Old Robert leads a very ordered, repetitive life. Every night he counts his things and looks at the moon. Until the evening that he sees a dancing cat and, breaking the habits of a lifetime, invites her a board. More theatrical cats follow until he's finally joined by a cat who has no special skills but needs Old Robert. my ship in the slip at the dock. in a wee little hammock." Nursery rhymes are woven both into the text and the pictures. Jutte's style has loose curves and shaky lines but with strong outlines and color they create a beautifully unified picture of Robert, his cats, and their growing friendship. There's a gentle humor in the art, shown in the cats' antics and Robert's rather bewildered reactions to these animals that are disturbing his normal routines. Verdict: Not all kids will appreciate Joosse's wonderful language and Jutte's unique art (I've tried some of their books in storytime with meh results) but I love these myself. There's always that one special child who will enjoy something a little different and I'll purchase this one for that child. ISBN: 9780399254307; Published 2012 by Philomel; Borrowed from the library; Purchased for the library. I purchased this for the library because it had an attractive cover and my biography section is really, really, really outdated. It hasn't circulated a lot, but it's gone out a few times. I finally got around to reading it, and found it interesting - as much for what it includes as what it doesn't. My own experience with girl scouts was pretty much limited to reading about them in old British school girl stories. I think I might have noticed a few selling cookies at Walmart once in a while, but that's it. So I came to this book with a completely open mind. 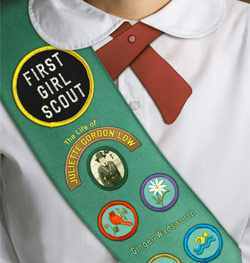 The first half of this book is a biography of Juliette Gordon Low, the woman who brought Girl Scouts to the United States. It begins with her parents early life and marriage and continues to Juliette's experiences in the Civil War as a young child, her education in a boarding school in New York, marriage into the English aristocracy, experiences in two world wars, involvement in the Spanish-American War, and many years of unhappy marriage cumulating in her husband's death and a lawsuit to regain his inheritance from his mistress. She was also partially deaf as a result of an illness and experimental medical procedure. It was not until she was in her early fifties that she became involved in the birth and growth of the Girl Scouts, first in England, as the Girl Guides, and then bringing them to America. Ginger Wadsworth brings in a myriad of interesting facts and historical context surrounding the life of Juliette Gordon Low and the beginnings of the Girl Scouts. She focuses on Low's exuberant personality and, while touching lightly on her failings, gives an optimistic picture of a woman who embraced new experiences and ideas, triumphed over difficulties, and had a genuine love for her family, friends, and the many girls she influenced. Verdict: From what I've observed, interest in Girl Scouts declines rapidly once girls hit about fifth grade. It's definitely not considered "cool." However, there are lots of younger girls involved in the organization and this is an interesting book not only for the biographical aspects, but of the rapid changes in history at the time. It does have a bit of an odd shape - it's a thick square - but I think parents and kids will pick it up. Biographies don't generally have a high circulation at my library, but this one I think will gather momentum. This week at the library; or, Last week of planning! More planning, planning, planning, enlivened only by my visits to two elementary school open houses (I handed out flyers on our after school programs), a dead rabbit (don't ask), and a 7:30am dentist appointment. I now have completed all the publicity for our fall session of programming, detailed plans for Preschool Interactive, We Explore, Messy Art Club, and my scheduled monthly visits to one of our daycares. I'm still waiting to hear back from more teachers for school visits, so I'll be adding to the outreach schedules probably. I'll be posting all my program outlines and feedback on Thursdays and my outreach stuff on Tuesdays.